Recent anti-abortion bills have got me thinking how the Taliban has some things in common with the far-right here in America. (Trolls: No, I am NOT saying they're the same, so don't even start.) 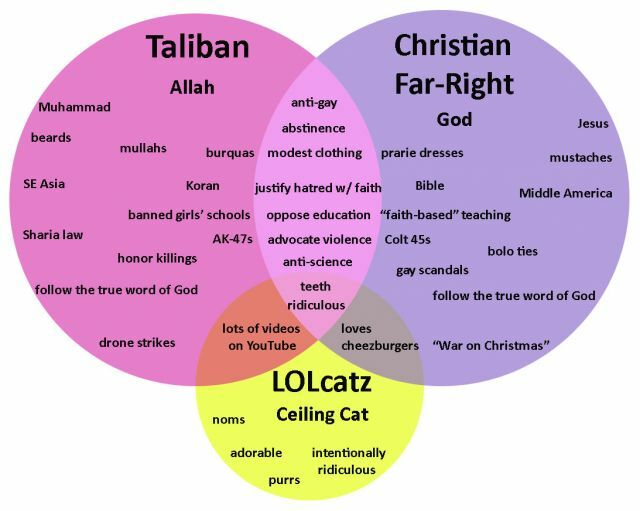 I've made this Venn diagram comparing the Taliban to the Christian Far-Right and, for a good measure, threw in some LOLcats. Enjoy. I think it was the LOLcatz that did it for me. After all, who can resist adorable noms?